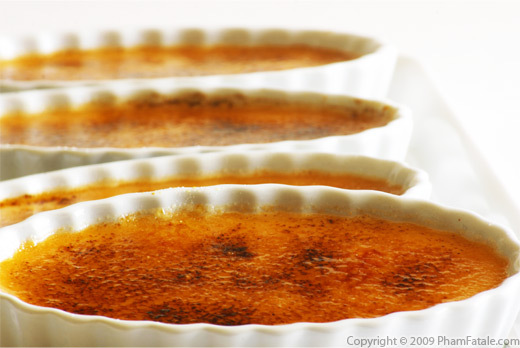 A pot de crème is an egg custard that is very often flavored with chocolate. It's sort of a French version of chocolate pudding. Preparing it is very easy. 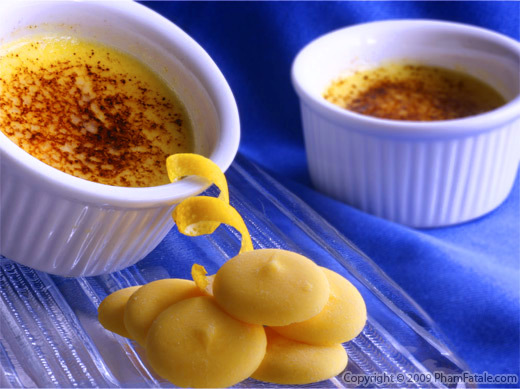 You basically follow the recipe for crème brûlée, but you bake the custard a little longer to get a thicker result. Break the chocolate bar and cut into small morsels using a chef's knife. On the stove, pour the milk and cream into a sauce pan, bring to a boil. Remove from the heat right away and add to the milk chocolate. Keep stirring until the chocolate is melted. Add the pinch of salt. Set aside. Separately, whisk the egg yolks with the sugar in a mixing bowl until it becomes a pale yellow. Add the vanilla extract and combine the chocolate liquid with the egg mixture by slowly adding a ladle of the chocolate/milk mixture at a time to prevent the yolks from curdling. Strain through a fine mesh to make sure there are no chunks of chocolate left. Fill 6 10-oz mini ramekins with the mixture. Place them in a warm water bath in a deep baking pan. The water should go half way up the side of the ramekins. Cover the dish with a sheet of aluminum foil and bake for 40-50 minutes. The texture of the cream should be jiggly but not too liquid. Let the pots de crèmes cool first, then plastic-wrap each individual ramekin and place in the refrigerator for at least an hour. 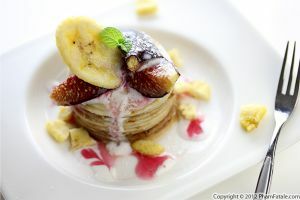 The fat from the cream may pick up some other odors from the refrigerator if the ramekins are not sealed properly. When serving, add a dollop of whipped cream and decorate with a small berry and a teeny mint leaf (I get them from my garden). Finish the decoration by sprinkling a little powdered sugar on each ramekin. 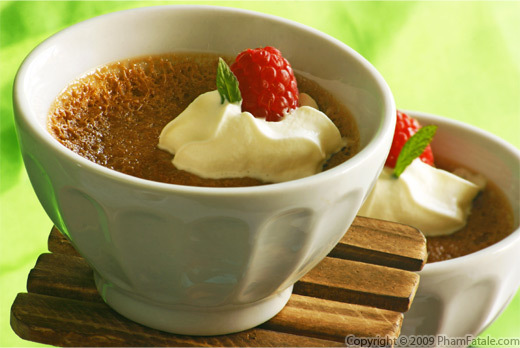 I like to serve my pot de cremes in tiny size ramekins so that my guests always ask for more. I serve them in 6 mini-ramekins or you can serve them in 4 regular ramekins for very hungry (greedy) dessert eaters. Set aside the egg whites in the refrigerator and save for tuiles (literally roof tiles in French). While waiting for the milk and cream to boil, you have to be very careful. Don't go anywhere else. If the phone rings or someone's at the door, let it be. You gotta focus on your milk and cream otherwise you'll be cleaning your stove and scraping the burnt milk all night long. As soon as some bubbles come up, remove from the stove and immediately add to your chocolate chips. I used Valrhona French Milk Chocolate. I got them directly from my local market but you can order through Amazon if you can't find them. When you take the pot de cremes out of the oven, they should be a little jiggly. Refrigerating them for at least 3 hours helps create a firmer consistency. Salt brings out all the flavors. Don't believe me? Hear Cory Barret, Pastry Chef at Lola who just compete against Iron Chef Michael Simon. 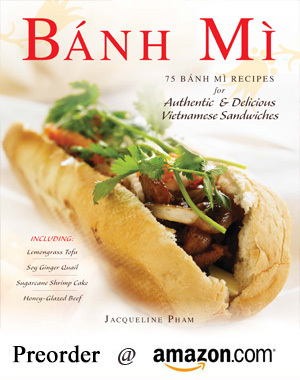 Published By: Jacqueline Pham on March 11, 2009. Jackie, I love how you garnished with the swirly whip cream and raspberry, but my favorite part is the tiny mint leaf. Beautiful! I believe you mean milk chocolate, as there is later mention of a chocolate bar. This looks outstanding! I must try this recipe this weekend. Thanks for sharing! Do you think it would be ok to make this recipe a day in advance and leave the custards in the fridge? Thanks for asking. You can store the pot de crème in the refrigerator for up to 2-3 days. No worries. 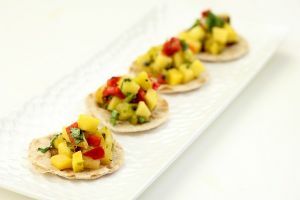 Just make sure to remove the dessert 15 minutes in advance prior to serving and add the garnish at the very last minute. I always make them a day in advance before I host dinner parties. One more thing: Plastic-wrap each individual container when storing in the refrigerator. The fat from the cream may pick up some other smell from the refrigerator if the containers are not sealed properly. I am not sure if you know,but someone is using your photo of pot de creme on the youtube as a thumbnail. 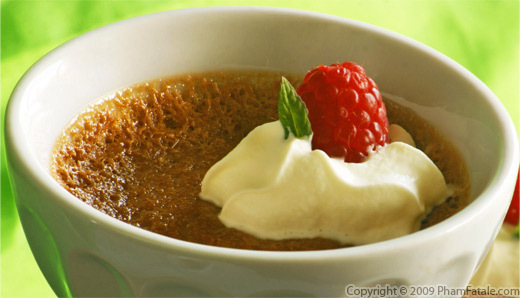 Search for "pot de creme" and you will see it.